Important Information from the Music Department! Please be sure to read it in its entirety as I have updated sections. IMPORTANT!! Ms. Beekman and Mrs. Bussean will be at a Band Director Conference on Tuesday, February 26. Due to that conference, there will be NO BAND OR SECTIONALS at MIS. This does NOT affect MJH. Concert and Symphonic Band WILL meet on Tuesday, February 26. 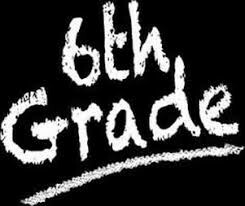 Beginning Band and Cadet Band will NOT meet on Tuesday, February 26. Please watch for an email from Ms. Beekman. The Concert and Symphonic Bands will be going on a Field Trip on March 4. More information will follow in future newsletters. 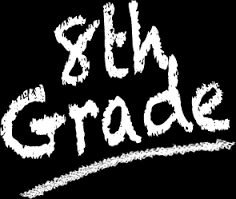 IGSMA District Choir Contest will take place on Saturday, March 9 here at Mokena Junior High School. See below for more information. WE NEED PARENT AND STUDENT VOLUNTEERS! Please check Charms and sign up for a time slot to help out! 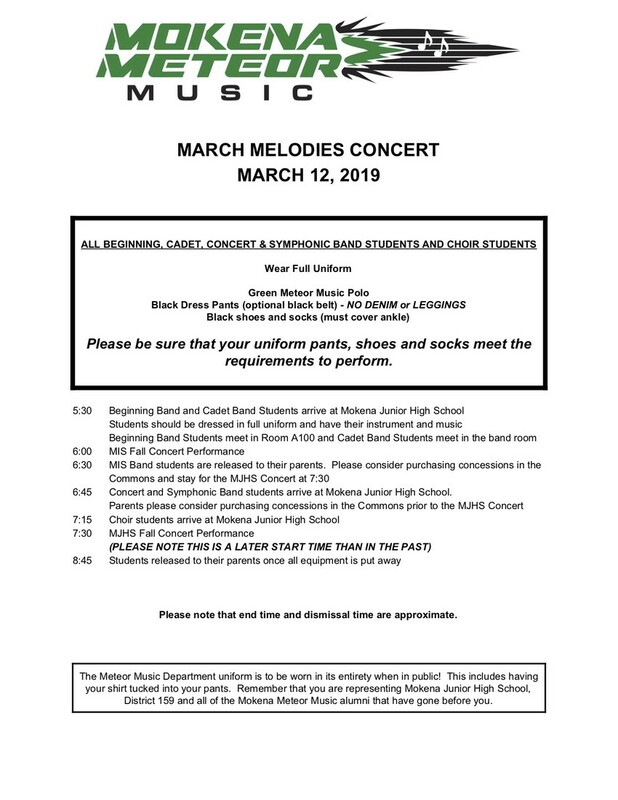 March Melodies Concert will take place on Tuesday, March 12 at Mokena Junior High School. See below for the itinerary. 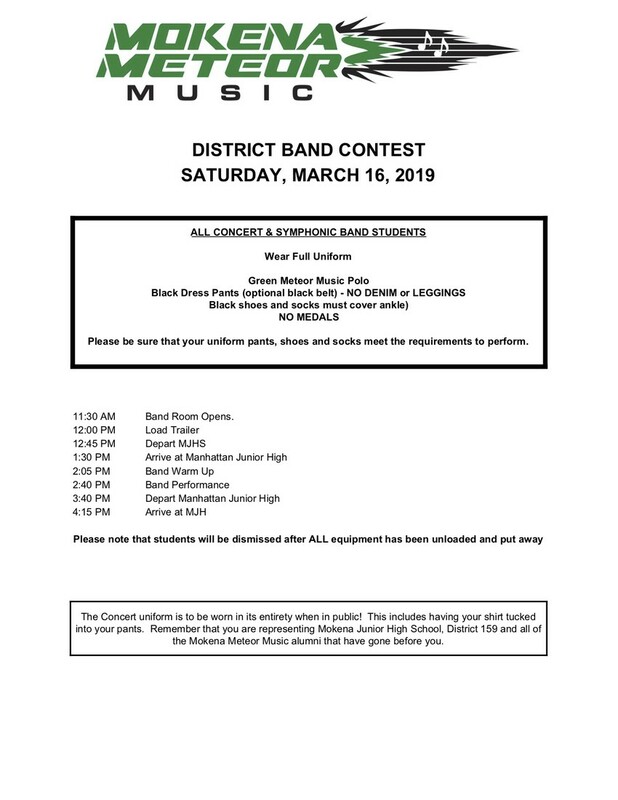 IGSMA District Band Contest will take place on Saturday, March 16 at Manhattan Junior High. More information below. Please have your band students check their Google classrooms for missing assignments and also check your Skyward grades. MANY students have outstanding assignments. Please submit them as soon as possible. 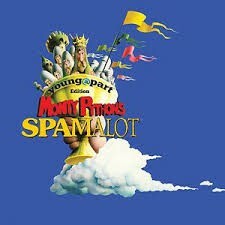 SPAMalot Cast and Crew members who missed having their photos taken MUST contact Mrs. LaChat directly to have them taken. More information can be found below. 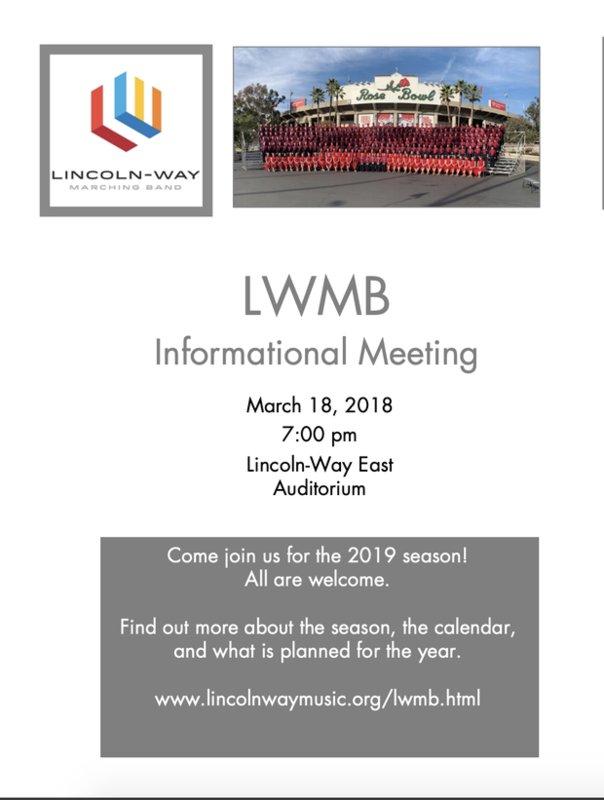 8th Grade Students interested in joining the Lincoln-Way Marching Band or Color Guard next year - please read below for information regarding an information meeting. Concert/Symphonic Band Field Trip to Northern Illinois University! The Mokena Concert and Symphonic Bands (6-8) will be having a field trip to Northern Illinois University for a clinic with Dr. Thomas Bough on Monday March 4th during the school day. While at NIU, there will be a 2-hour clinic in the concert hall for all band students covering a variety of concepts including the music we will be performing for IGSMA contest. We will also be receiving a tour of the school of music. Students should have already turned in their permission form and payment. If you have any questions, please contact Ms. Beekman at beekmant@mokena159.org. Students/parents can volunteer (we'll try to have non-choir volunteers for the early morning times so choir families can view the performance). Since we're hosting this contest, we will be looking for volunteers! There will be volunteer slots made available for adults and students. Adult volunteer requests will be sent out via email from the Music Boosters (as they've done for past events this year). Students will be able to sign up for volunteer on sheets that will be posted outside of the band room prior to the event. Please continue to check the Google Classroom for any assignments for band. If your child missed an assignment, please encourage them to finish it and submit it to their band director as soon as possible so we can update their grade. MANY STUDENTS HAVE MISSING ASSIGNMENTS! Thank you to all the students who submitted their assignments on time! The itinerary is below. If you have any questions, please contact your director. Help Support the Music Boosters by Shopping Online! The AmazonSmile fundraiser is available year round - not just at Christmas time. This is a great way to support our music programs without any cost to you! Any time you are shopping via Amazon, please consider using Amazon Smile for your purchases. 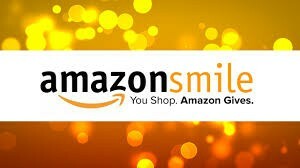 Go to www.amazonsmile.com. You can select the Mokena Music Boosters to receive a donation on your behalf just by making your regular Amazon purchase through them. It doesn't cost you anything and helps the Music Boosters fund our programs. This is available year round. If you have any questions, please contact Mrs. Bussean. Come out on Tuesday, March 19, 2019 at 7:00 PM to the monthly Music Booster Meeting held at Mokena Junior High School in the Library. Music Booster meetings are open meetings that anyone can attend. Come see what our Boosters are all about and how you can help support your child's music education. I look forward to seeing you there! DO YOU OWE MONEY TO THE MUSIC BOOSTERS OR THE DISTRICT? We still have quite a bit of outstanding money due in Charms. Please check your accounts over break and make sure you are up to date. Please be aware that the District is also reaching out about outstanding District participation fees. While this can get confusing, it is important that everyone understand that there is a difference between the participation fee charged by the District for participation in activities (ie basketball, track, scholastic bowl, band, choir, etc.) and the fees charged through the Music Boosters (Booster registration fee, books, polo shirts, etc.). Please make sure you are current on both sides. If you ever have any questions about this, please feel free to reach out to your director. Did you know that we have Facebook page? We do! Please search Mokena Meteor Music Department and request access. All posts must be approved first. We post information about what is happening in the department, Dine and Earn information, fundraising information, etc. Students are responsible for getting to Sectionals on time and for notifying their classroom teachers IN ADVANCE. Students are also responsible for getting any missed work. 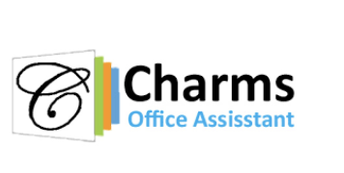 Charms is software that will keep track of all our events on a live, interactive on-line calendar - available to all students, members and adults by group. Teachers are able to send mass e-mails, record and blast phone messages and send free text messages. We are able to upload handouts, sound files, short videos, assignments, audition materials, maps, pictures and more for students, members and parents to access 24/7, either on their computers or on their mobile devices. Our school code is MokenaMusic and your password is your child's Student ID number (available on Skyward). If you have previously signed into Charms, your password is the one you set up. IMPORTANT - If you missed having your head shot taken, you must make arrangments with Mrs. LaChat to have your photo taken at her studio in Mokena. Please contact her at jeanlachat@comcast.net or call her at (708) 263-7269. If you do not have your photo taken, it will not be included in the program. Please make sure you bring your script. We do not have any extras available. If you lose yours, you will need to pay $10 to replace it. Parent help is appreciated. Come if you are available. Students should dress appropriately and wear shoes. We are asking students to have safety goggles and gloves (to protect their eyes and avoid splinters). These items can be purchased at your local hardware store and I believe goggles can even be purchased at the Dollar Store. If your student has a drill, bring it. 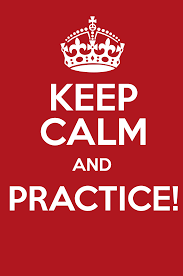 PRACTICE LOGS ARE DUE EVERY SUNDAY! 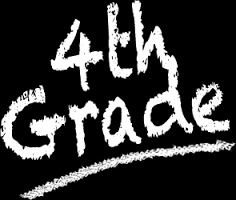 For now, 4th graders do not need to worry about this. We will let them know when they should begin documenting their practice time. Once again, practice logs will be required weekly through the Charms system. Practice logs are due EVERY Sunday before midnight. Students should enter their time in the Charms Website. We have been implementing a new grading scale this year, but the minimum practice requirements are the same as they have been in years past.